Order now for your best deal. Prices may rise when sales goals are met. The Process: When you order, your card is billed for the full amount. You will get an auto-email by the next business day. For example Fri/Sat/Sunday orders get an email on Monday. Weekends/Holidays are not counted as "days". Your Shipping Address: Please ensure your address is correct when you order. Last minute changes incur delays and/or extra costs. Your address can be changed on the 3rd page of checkout by clicking on "change" beside the address. 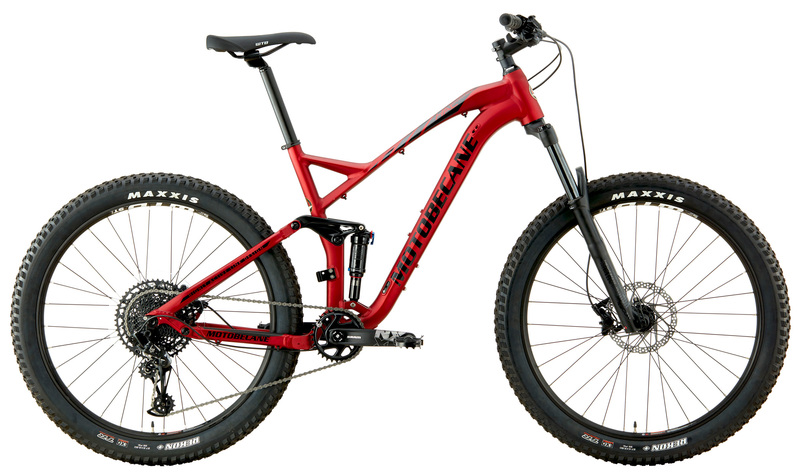 This is the much anticipated mid-fat, Plus Bike with Boost Axles HAL Boost (Highly Active Linkage) by Motobecane USA. Building upon over a decade of FS design, this HAL BOOST 27.5+ Full Suspension is designed for up to 5 inches of terrain taming travel both front and rear. The HAL Linkage uses a chainstay mounted pivot for even more supple suspension tracking and incredible control even while applying the brakes. Chainstays are optimized on the HAL Boost models for incredible Billy Goat climbing and traction. 140mm travel, weigh approx 29.5lbs tubeless (On Sale $1599). What Are the Widest Tires One Can Use on the HAL BOOST Full Suspension Plus Bikes? Bottom line it’s an attractive and affordable package that leaves plenty of budget for down-the-road upgrades. …exciting sibling model announced…Team Version with RockShox Pike forks, and XTR / XT 1x11 Speed, Guide Brakes…is ridiculous value and it will be an awesome performer. AFT / MTBR.com "Just put 11 miles on the new bike! This thing is amazing!! Can't get enough of these shocks, that and the rear derailleur shifts so damn quick. Love it!" Daniel E. MTBR.com "Wow this bike is incredible…this is the best and probably most expensive bike I've ever ridden, but I couldn't have even imagined a bike feeling this great on a trail. Not sure on the weight, but it feels very light and quick (I'm tubeless, which may help) while still being stiff. The travel is a lot, but I was able to use what looked like 80-90% on my ride today while still feeling efficient on the flats and climbs, noting that I was playing around with the rear lockout…Everything about this bike is great, looks amazing, hell even the saddle is very comfortable. JR Glenni MTBR.com "…my Hal6 Expert climbs great. Down shifting is firm and quick even when shifting late or downshifting more mid climb, and I didn't really notice pedal bob on the climbs. The front did tend to lift up on me more than I was used to, but I'm coming from a hard tail 29'er that was more of an XC design with a longer wheelbase, so that's not surprising. I was still able to climb pretty quickly with it, and I don't think the light(er) front end will be an issue as I get more used to it." Jeff R MTBR.com "I am also coming from a hardtail 29er, but feel that my hal6 climbs just as good if not better on technical climbs. I'm not fighting for my back wheel to maintain traction and it soaks up the roots, rocks, and bumps… On Saturday, broke my strava record for a technical climb I do regularly on my hal6 without even trying…All in all, I'm very impressed with the overall performance of the bike…"
CC H. MTBR.com "I did another really technical climb on my hal 6 pro...I made it way further than I ever have on any other bike. Its narrow, rocky, rooted, and steep and even I was amazed at what I made it through. Part of the advantage of this bike is the high pedal clearance. I could also feel the back just sticking down, never spun out once even when leaning forward. I attribute that to the suspension, and the nice tires. The feeling of the bike under me is light and stiff. I assume the hal5 will climb better than the hal 6 because of a steeper head angle, and less travel front and rear. I will be doing a direct comparison with my friends 2019 stumpjumper FSR comp. the frame angles and measurements are almost identical on paper except for the seat tube on the Hal being steeper by 1.5 degrees…"
A high level of engineering and attention to detail is seen on all Motobecane mountain bikes.This video is of the 29er, cousin to the much anticipated Full Suspension 27.5/650B by Motobecane USA. Building upon over a decade of FS design, these bikes are superb offroad machines. The HAL (Highly Active Linkage) Design represents to top of the food chain. Super supple and more control than ever. Imagine the trails you will dominate with massive traction 27Plus Tires and a Rockshox RECON SOLOAIR 140mm up front with up to 5 inches of travel in the rear. Test riders Compare the HAL Boost to Full Suspension Fatbikes like the Salsa Bucksaw. They say the HAL Boost is a turbo-charged Dakar Rally car. The Salsa Bucksaw would be more like a dually truck. 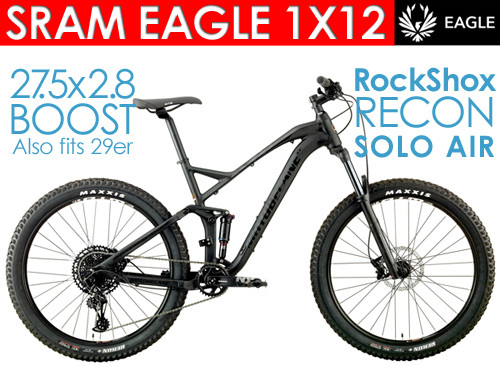 No corners are cut, the HAL Boost EAGLE NX SRAM 1X12 has top-of-the-line Full Race specs. A 140mm Rockshox RECON SOLOAIR 27.5+/29er Boost fork with up to 140mm of travel + in the rear, the NEWEST Rockshox MONARCH Air rear shock with Rockshox Rebound Technology. The HAL (Highly Active Linkage) Design represents the top of the food chain. Super supple. Climbing, descending and braking with more control than ever. The HAL Boost Series features shorter chainstays than ever before = Billy Goat climbing ability and traction. The drive train is race proven. Eagle DUB cranks. An sealed bearing headset, proven Sealed Bottom brackets. Advanced SRAM EAGLE 1X12 drivetrain with Eagle 1X12 clutch rear derailleurs and incredible Shimano Hydraulic brakes and levers. Motobecane USA has dialed in a race-proven geometry into this phenomenal ride. Very responsive and yet stable. Just like the award winning FLY Team hardtail, singletrack and switchbacks are all handled with ease. With the HAL BOOST series, you've got an incredibly capable full suspension mountain bike that'll do just about anything for Thousands less than any other bike. 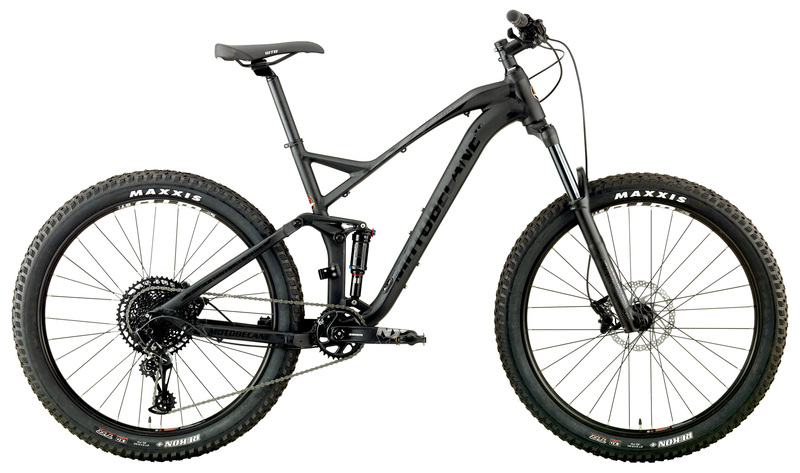 What is Boost: The HAL Boost is a Boost spacing mountain bike. Boost is a new dropout standard designed to widen the hubs on the previous standard MTB spacing wheels. The rear axle is wider by 6mm to 148mm and the front axle by 10mm to 110mm. Wider flanges = wider bracing angle for spokes = a stronger and stiffer wheel. Allows the use of 29er wheels with higher strength and stiffness for top performance. Also, More tire clearance, ability to use 27PLUS tires and with shorter chainstays for superior handling and climbing. With the HAL Boost's stock 27.5x2.8 tires you can hang with virtually anything on the trail. No worries about dealing with a Fat bikes super wide BB, the crank/pedals are no wider than a normal bike. Virtually all the float and traction of a full on full suspension fat bike, without excess flubber and jounce. Put in your own Boost 29er wheels and tires (fits most 29x2.5) and you'll have a warp speed 29er Boost Enduro / XC Rocket! 38cm - 5'5" to 5'7"
43cm - 5'8" to 5'10"
48cm - 5'11" to 6'1"
52cm - 6'2" to 6'4"
HEADTUBE 1-1/8"/1.5" ( 44/56mm ) L: 38/43/48/52M=100/120/130/140mm. Internal / External Dropper SeatPost Routing.